between business people from different countries is becoming more frequent. The more national boundaries a company crosses, the greater the scope for misunderstanding and conflict. To succeed internationally, it is essential that managers are able to break the barriers of culture, language and set patterns of thinking. 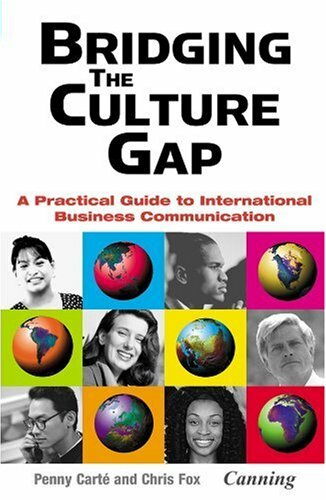 "Bridging the Culture Gap", written by two of Canning's most experienced trainers, is a distillation of many years' work and is based on the real-life business situations of their international clients. Canning was established in 1965 as one of the first training companies to offer specialist cross-cultural programs tailored for business. Their trainers and consultants run courses in 41 countries on four continents. Current clients include Aventis, Borealis, Cap Gemini Ernst & Young, GlaxoSmithKline, Matsushita, Munich Reinsurance, Nissan, Renault, Samsung, Schnedier and Toshiba. Contents include: * Interpreting the party line (mission statements; corporate initiatives; working rhythms; communication styles) * Knowing your place (handling the hierarchy; taking responsibility; monitoring performance; getting people to play ball) * Knowing the limits (rules, regulations and the laws of the land; gifts, favors and bribes; nepotism; discretion v. dishonesty)* Knowing the form (greeting people; making small talk; playing the conversation game; choosing what to say and how to say it; trying to be funny; avoiding hidden dangers) * Making presentations (choosing the right style; finding a concrete context; speaking with impact) * Making deals; picking the right people; thinking about pace and place; playing the game to win)* Knowing yourself (relationships; communication; time; truth; the meaning of life).